WASHINGTON — A new National Space Strategy announced by the White House March 23 fits into an “America First” theme of the Trump administration, seeking to protect American interests in space through revised military space approaches and commercial regulatory reform. The strategy features four “essential pillars” that constitute “a whole-of-government approach to United States leadership in space, in close partnership with the private sector and our allies,” according to the document. Three of those pillars are related to national security activities in space, including a shift to more resilient space architectures, strengthening deterrence and warfighting options in space, and improving “foundational capabilities, structures, and processes” that include space situational awareness, intelligence and acquisition issues. The document emphasizes the threats that American space assets face, an issue that predates the administration. “President Trump’s National Space Strategy recognizes that our competitors and adversaries have turned space into a warfighting domain,” the document states, echoing language that Trump himself used in a March 13 speech where he also suggested the creation of a “space force.” The strategy itself does not endorse or discuss that issue. “The strategy affirms that any harmful interference with or attack upon critical components of our space architecture that directly affects this vital interest will be met with a deliberate response at a time, place, manner, and domain of our choosing,” the release states. The fourth pillar of the document is devoted to developing “conducive” environments for working with commercial and international partners. “We will streamline regulatory frameworks, policies, and processes to better leverage and support U.S. commercial industry, and we will pursue bilateral and multilateral engagements to enable human exploration, promote burden sharing and marshal cooperative threat responses,” the release states. The administration had already been moving to streamline commercial space regulatory issues. The National Space Council, at its most recent meeting Feb. 21, endorsed several recommendations on topics ranging from launch licensing to enhancing the role of the Office of Space Commerce within the Department of Commerce. While the strategy backs cooperation with international partners, it also emphasizes that the U.S. will do so only on terms the administration deems favorable. “The new strategy ensures that international agreements put the interests of American people, workers, and businesses first,” the document states. The release says little on civil space activities beyond stating the strategy is “laying the groundwork for the next generation of American exploration in space.” It does note the signing of Space Policy Directive 1 by President Trump in December. That directive modified existing national space policy, issued by the Obama administration in 2010, to make a human return to the moon a goal for NASA’s human spaceflight program, while maintaining human missions to Mars as a long-term goal. The National Space Council discussed the development of a National Space Strategy, part of a broader national security strategy, at its first two public meetings. 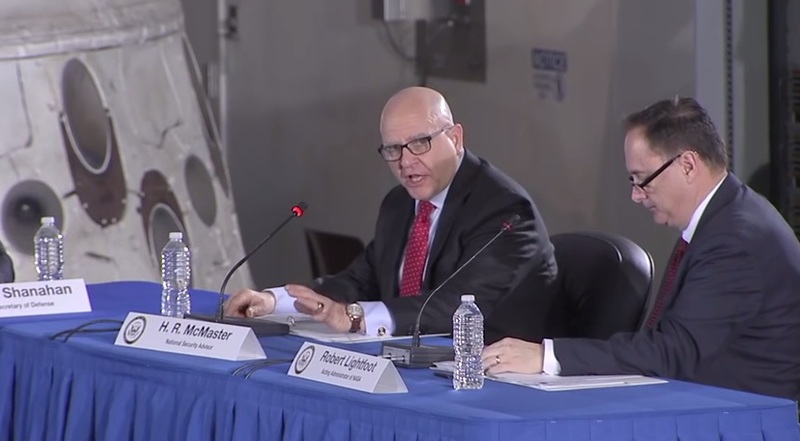 At the second meeting Feb. 21, H. R. McMaster, the national security advisor, discussed the “important progress” made to develop the space strategy. That included the development of four “interrelated lines of effort” that match the pillars listed in the March 23 release. “The strategy will not only advance the benefits of space for ourselves, but also ensure the peoples of all nations can benefit from the tremendous potential that space offers,” McMaster said at that meeting, chaired by Vice President Mike Pence. “With your endorsement, Mr. Vice President, and the president’s approval, we are prepared to begin implementing this national strategy for space and periodically access progress and recommend adjustments to you and the council and the president,” he said. McMaster, though, will not be able to provide those updates. President Trump announced March 22 that McMaster would be stepping down as national security advisor effective April 9, to be replaced by John Bolton, former U.S. ambassador to the United Nations during the George W. Bush administration.